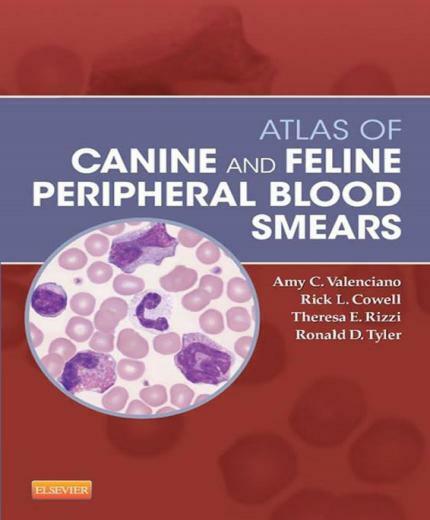 An illustrated guide to the morphology of blood cells, Atlas of Canine and Feline Peripheral Blood Smears covers patient assessment for common hematologic disorders and diseases in dogs and cats. Over 1,000 full-color photomicrographs depict abnormalities within each blood cell line, with multiple pictures of each morphologic abnormality and variations in their appearance. Written by pathology experts Amy Valencia no, Rick Cowell, Theresa Rizzi, and Ronald Tyler, this concise reference will enhance your skills as you interpret blood smears and recognize hematological cellular response to inflammation, infection, and toxicity. Over 1,000 photomicrographs facilitate microscopic analysis and interpretation of the cellular components of the blood.Full-color, high-resolution images facilitate identification of different blood cell types, numbers, anomalies and conditions.Multiple representations of morphologic abnormalities aid in recognition of conditions where variations in appearance commonly occur. Practical information includes an overview of laboratory methods, equipment and supplies, sample collection, staining and handling, and diagnostic interpretation of blood smears.Coverage of 125 topics ranges from the morphology of erythrocytes to chronic myeloid leukemia. Spiral binding allows the book to lay open next to the microscope, making it a quick and easy reference while on the job.